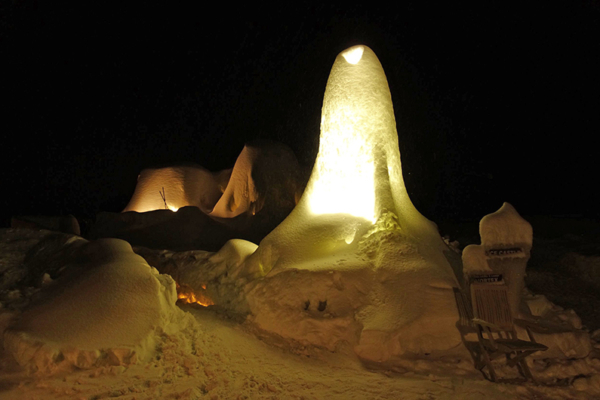 The Niseko Ice Village is a marvel born from the natural elements of Hokkaido, assisted by the creative minds of a team of passionate local ice artists and assistants. 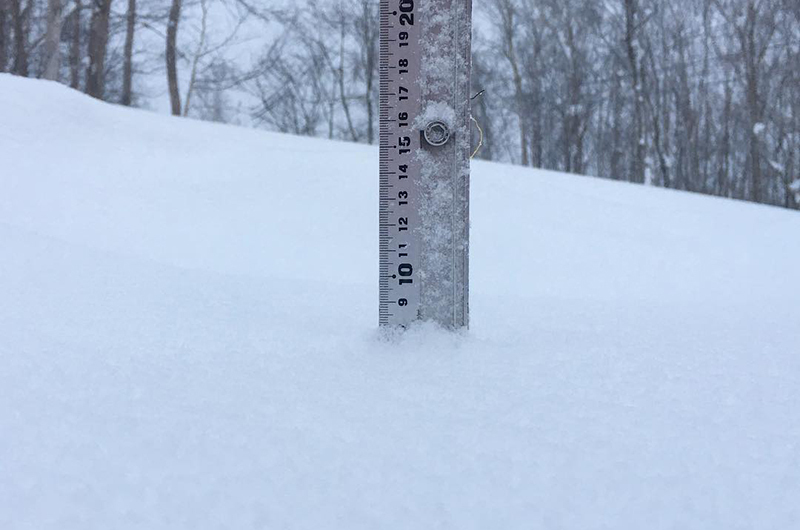 An eclectic collection of domes and structures, the village grows and changes shape throughout winter across the fields of the Saison Club estate in Soga on the road between Niseko Village and Annupuri. The fascinating complex is staged over multiple levels, some of which you can move between via ice slide. 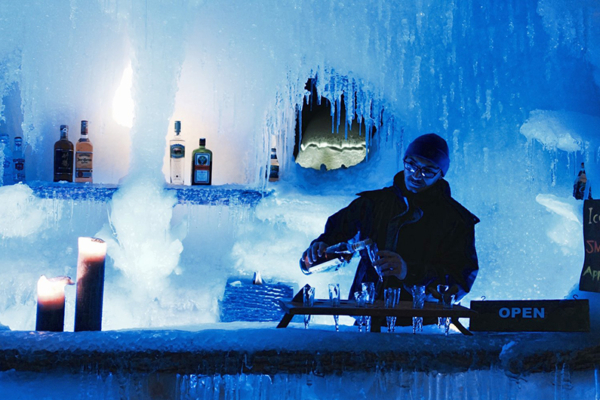 There are different rooms and spaces for partying, chilling (literally) on ice lounges covered with furs, or admiring the natural art work on display, like hundreds of icicles hanging from ceilings illuminated by carefully placed and changing lighting. As you walk through the halls and passageways of the village, what may at first have appeared to be a random creation of nature turns out to be a carefully planned piece of artwork. 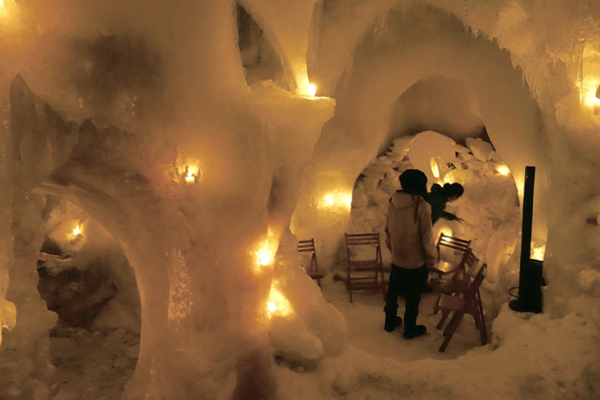 The village’s mastermind is Hirohiko Takenaka, a second-generation ice artist who grew up watching his father make similarly wonderful creations around their home alongside Lake Shikotsu – the huge lake you drive past on your way from the airport. Hiro-san is an “elemental sculptor”, working with nature’s elements to help shape his creations. 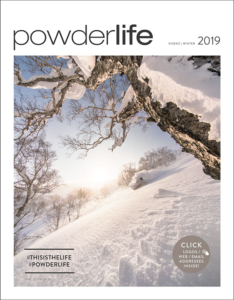 He previously made an ice bar in Hirafu until several years ago, when Annupuri pension owner and fellow ice artist Wataru Miyazaki lured him back to Niseko to help take on this new project. 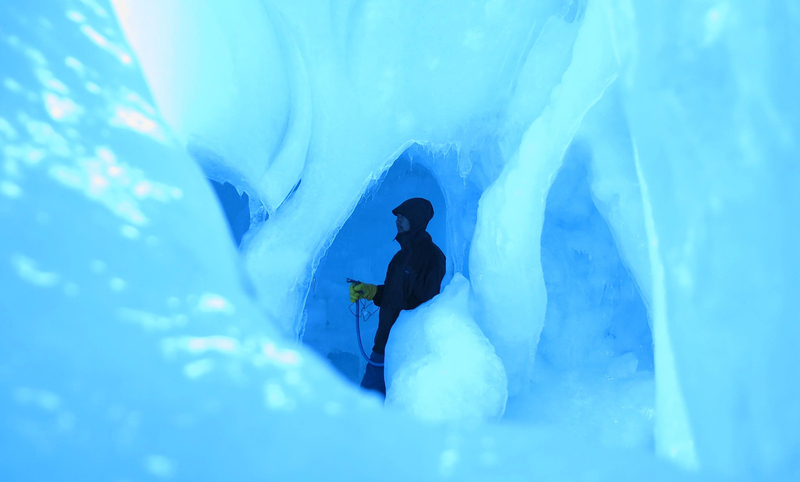 The first step in creating the village is to inflate giant balloons, over which Hiro-san and his team spray water when the temperature drops below zero in late November and early December. 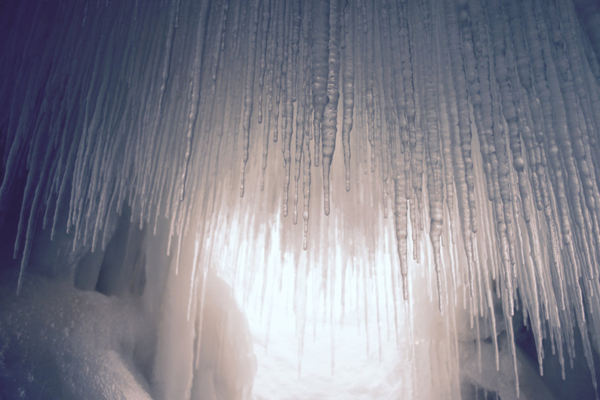 This makes the structural domes, into which strategically placed holes are cut to allow wind through, moulding the way the ice forms as the water freezes. This, Hiro-san says, is a beautiful collaboration between man and mother nature. 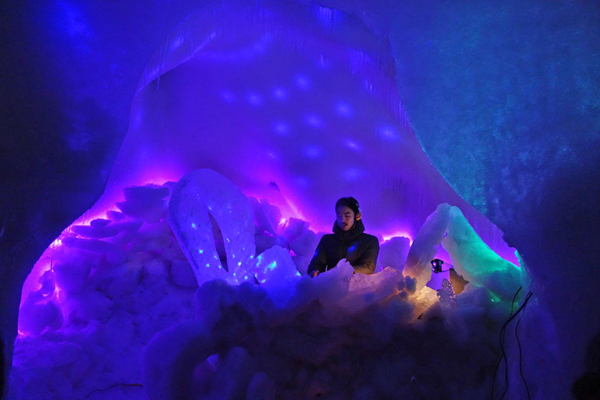 During the day the ice village has a playground outside with ice slides. 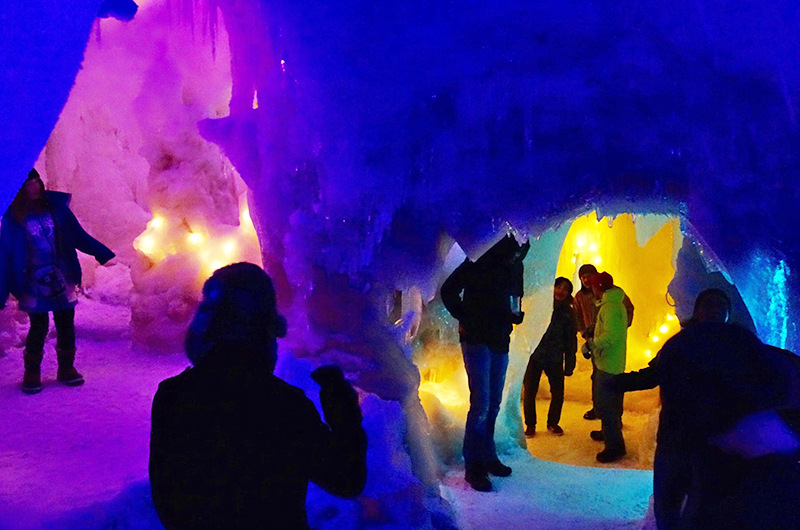 After dark it becomes colder inside and out, so visitors can step inside Chillout Bar Vortex, an indoor bar offering a comfortable respite to grab a drink and warm up frozen fingers and toes. Depending on weather the village should be open by Christmas and until early March. Tell your driver to go to Saison Club in Soga or catch the free shuttle bus from Hirafu. Entry is ¥500. For inquiries about private parties and upcoming events please go to facebook.com/nisekoicevillage.